OFF TO UNI – A FIRST FOR US! Picture perfect, whether it’s a Freshers’ Fair, a university special event, faculty gathering, Leavers’ Ball or Graduation… our photo booth hires are ideal for capturing the occasion throughout central London. 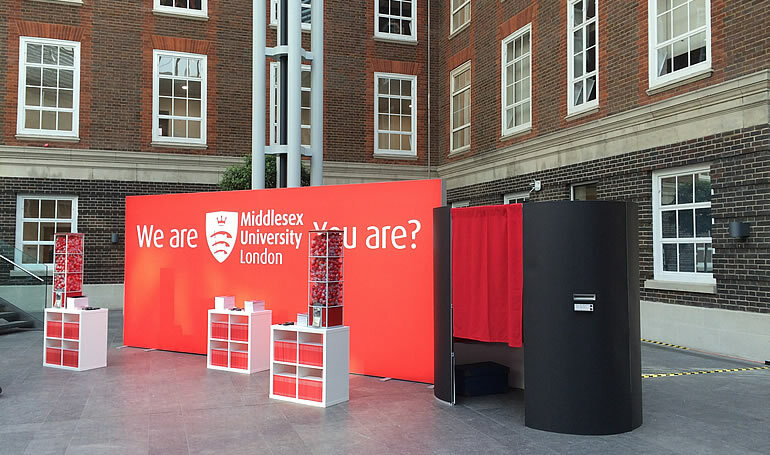 Whether you choose an enclosed photo booth or a stand alone contemporary booth – as seen on Dragons’ Den – we can provide photo booth hire throughout London, Essex, Surrey or Kent, and set one up at your campus. We popped along to the annual North London Higher Education Fair and open day, held at Middlesex University recently. This saw more than 2,000 local students visit the campus and offered an excellent opportunity for students to meet around 60 universities across the UK, gather information, attend subject specific talks and explore the campus to gain an insight into what university life is really like. Photo booth hire for higher education events is a growing area of customer interest for us because our booths are great fun, yet pieces of equipment which are so easy to incorporate and set up at marketing events such as university open days. We also offer personalised strips – including logos, the event date, university website details and hashtags – at no extra cost. A take away strip of pictures is a great reminder of what potential new students saw on the day. They’re handy to carry, a stylish, fun souvenir, with that all important website or social media link to your university (all our photo booths come with social media sharing options). We enjoyed going to uni for the day and the photo booth hire received lovely feedback from staff and students alike. If you have a forthcoming university event and are interested in hiring a photo booth (plain or customised) in central London from a helpful, experienced and innovative supplier, then get in touch with us today. We’ve just provided a custom designed photo booth pod for Harvey Nichols’ Festival of Style. 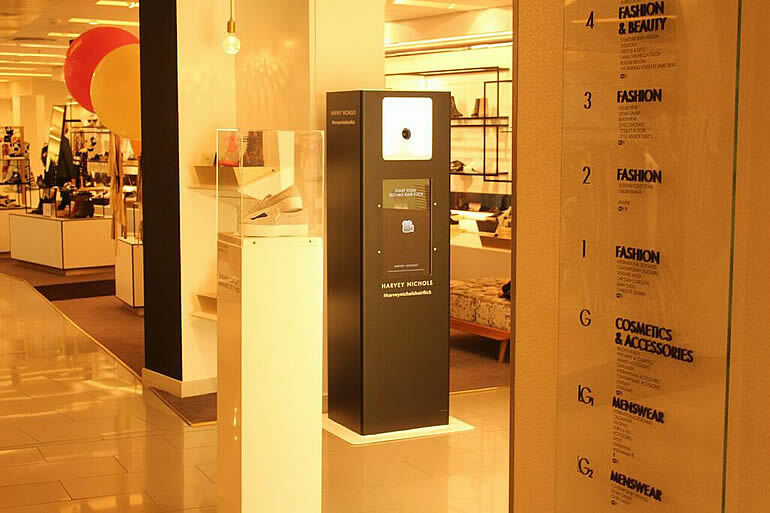 A stand alone contemporary booth – one of Photoboothy’s many available photo booth hire options – it was installed in the flagship store in Knightsbridge for five days. During that time, customers were invited to start the summer party early, with all eight floors transformed for the event. And they certainly did… taking the opportunity to indulge in a four-day extravaganza of live music and stylish entertainment, headlined by singer/songwriter Jessie Ware performing at the flagship store in central London. We custom designed a free-standing contemporary photo booth specifically for the event. It’s one of the hottest products on the market at the moment, because it was designed to record slo-mo videos and placed outside the Daniel Hersheson hair salon on the fourth floor. Slo-motion video recording is the latest craze to be released throughout the industry. Everyone loves it and we’re finding more and more people are becoming familiar with it. Slo-mo is the new fast, especially since new iPhone models can capture and record high quality slo-mo video at the flip of the camera app setting. Our stylish photo hire booth received excellent feedback and we thoroughly enjoyed the opportunity to showcase slo-mo in such an iconic and landmark luxury store. So, fast forward to the future! If you have a forthcoming event or work for an event company and are interested in hiring a photo booth in London – which you can have customised – we will help. Our software now has the ability to record slo-mo videos and GIFs – as well as the ability to share via social media directly from our photo booths. Whatever the requirement, if you’re seeking an experienced, forward thinking, innovative supplier, then get in touch with us today. 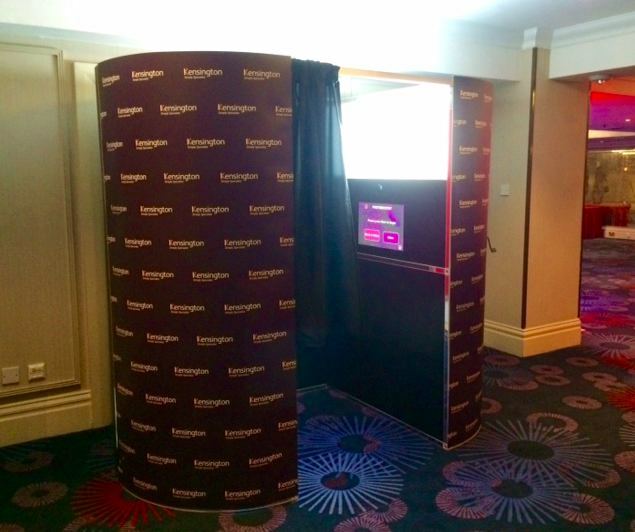 On Wednesday evening the Photoboothy Team were at the Grovesnor Hotel in Mayfair, Central London for the Mortgage Strategy awards 2015. The event was sponsored by Kensington Simply Specialist. They opted for a fully customised corporate photo booth. For any unique customised corporate photo booths we put our clients in direct contact with the supplier so the vinyl skins can be purchased at cost price. Our supplier is fantastic, very friendly and great customer service; their preference is at least 5 days notice to get the covers printed, however dependant on workload, they can turn them around even quicker if needed. 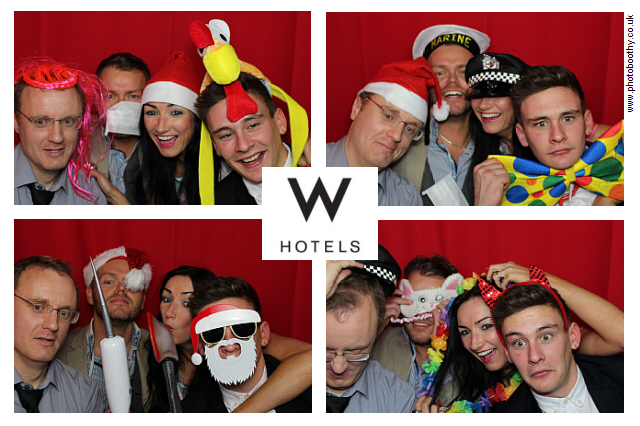 Do you have an event coming up where a customised photo booth would be useful? Maybe you could reach out and find sponsors? Get in touch with us today for more information on our competitive prices and photo booth hire options. Last week we had a photo booth rental at the renowned DSTRKT Club on Rupert Street, Central London. 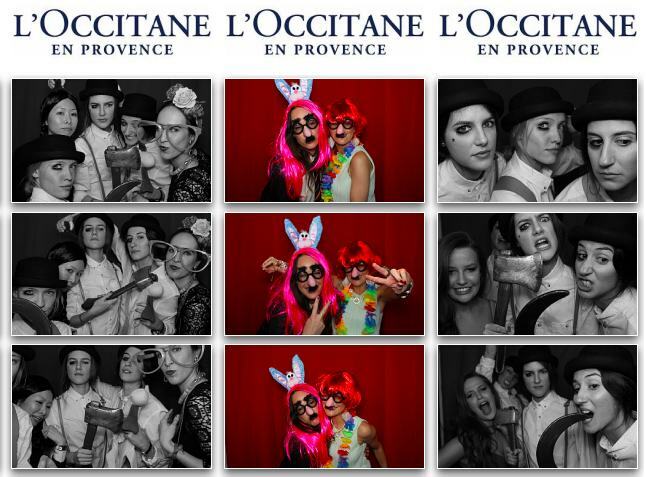 The client was L’Ooctaine and boy did they throw a party! Their theme was Hollywood and every single person in attendance was dressed to the nines – the effort they put in to their costumes was outstanding. The venue is incredible; from ambience and vibe, to the the music and staff – we couldn’t find a fault. As part of the photo booth rental service they also requested key rings, which turned out to be a great success. With their amazing costumes and our array of funny props to photos turned out great. If you’re looking for a Central London Venue to host a party, we highly recommend you check out DSTRKT Club. We were just catching up on Dragons Den from last night and there was one pitch that caught our attention: The contemporary photo booth company Zeven Media, which Deborah Meaden invested £50,000 for a 25% share of their company. 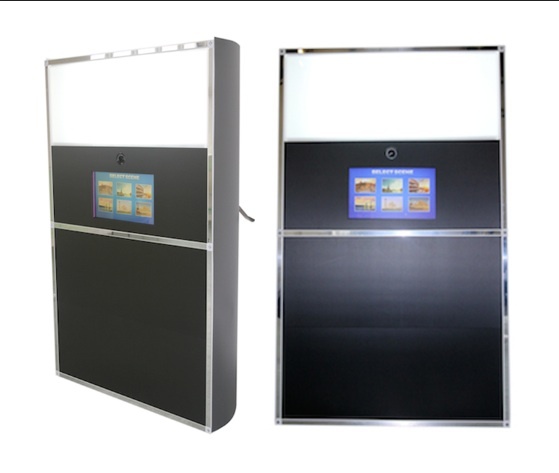 We are very keen to understand what our clients thought to their photo booths. Here at Photoboothy we actually offer an open air style photo booth (otherwise known as the selfie booth), designed specifically for companies and venues that lack enough space for a traditional style booth; it is a very similar concept as the booth that was featured on Dragons Den. All our photo booths come with social media sharing options, whether you want Facebook uploads, Twitter uploads, the ability to email the photos or send them via text message, it’s all covered. Our technology allows us to tailor the software to our clients requirements and we can also brand the screens too with your logos. One comment we found interesting, and we’re very keen to understand what you think, was a comment made by Peter Jones, who owns Jessops: Whilst discussing the photo Kelly Hoppen had taken he said “If I look at the picture Kelly has taken it’s got to be the most boring picture and photo I’ve seen; the fun about taking photos in a photo booth, is about putting funny glasses on, funny hats”. What do you guys think? Did you agree with his comment or do you think the market is changing? Would you pay to use a photo booth if there wasn’t any props to dress up with, or do you feel this would defy the point? Is there enough difference to make you as a client pay to have a photo taken on a selfie booth, rather than taking a photo on your phone and uploading the photo to social media? Photoboothy is always looking for ways to improve our services based on direct client feedback, so if you have any unique requirements or suggestions we would love to hear from you. 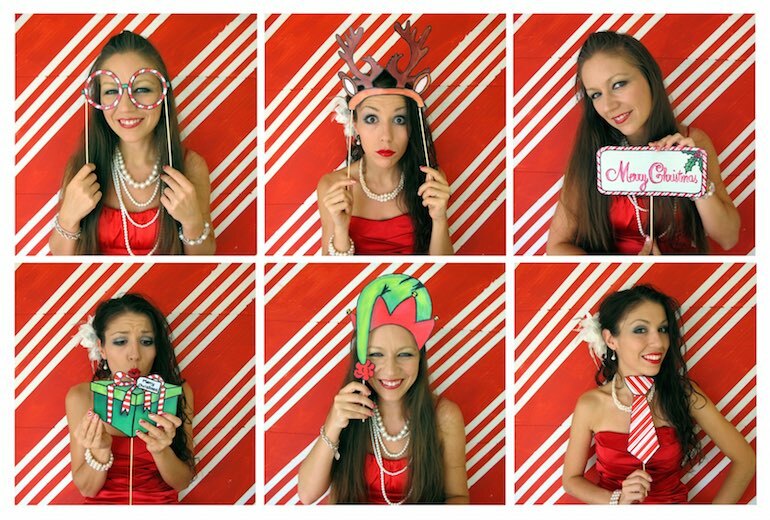 Christmas photo booth hire – ready for a party? With the party season almost here, have you thought about how you could make your event extra special, with keep-sake memories that will last for years to come? Here at Photoboothy we LOVE a good party, and we’ve been shopping for Christmas props. As with any photo booth companies Christmas is our busiest time of the year, so forward planning is essential so prevent disappointment.